Raising all-inclusive to a New Level of Luxury®, every one of the resorts features Endless Privileges®, Unlimited-Luxury®, or Unlimited-Fun®, that offers sun-soaked beaches, elegant accommodations, a world-class spa, gourmet dining, unlimited premium drinks, and many other pampering amenities. 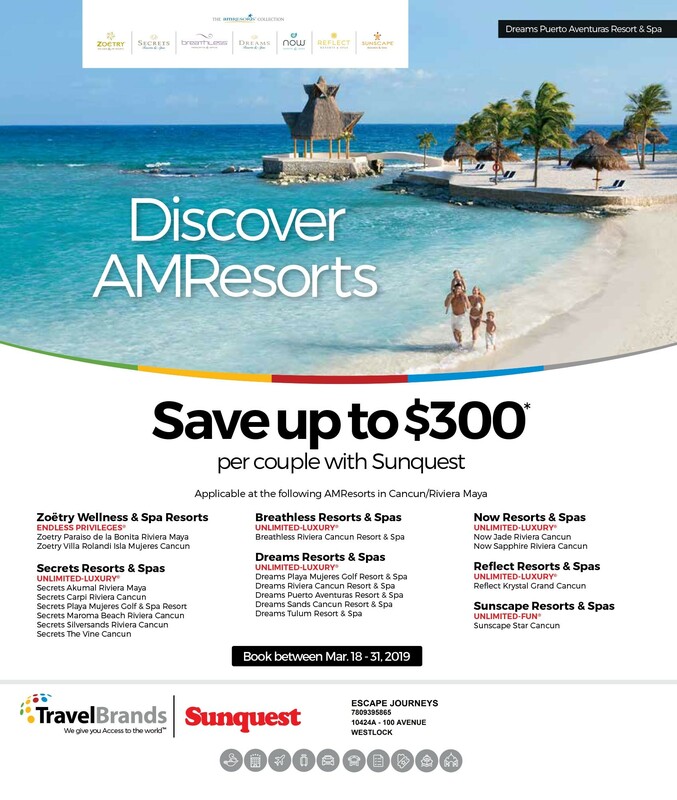 See for yourself what makes an AMResorts property the perfect setting for romantic retreats, family and friends reunions, weddings, honeymoons, anniversaries, meetings and more. Elegant AccommodationsRetreat to your well-appointed room or suite with your own furnished terrace or balcony. World-Class SpasExperience pure indulgence through the latest hydrotherapy and indigenous treatments. Gourmet DiningDine out at our diverse array of international a la carte restaurants or stay in and enjoy 24-hour room service. Unlimited Premium DrinksEnjoy fine wines, beers and other beverages in any of our bars, lounges or restaurants. Preferred Club PrivilegesExperience an even higher level of luxury with an upgraded suite and other enhanced amenities. Activities & EntertainmentFill your days with water sports, excursions, golf, yoga, swimming, concerts and dancing. Or doing nothing at all. Weddings & HoneymoonsSay “I do” in a magnificent wedding gazebo or on a beach overlooking the water. Write the next chapter of your life together in paradise. Unlimited ConnectivityExperience free WiFi and free international calling with our mobile app, now part of your Unlimited-Luxury® stay. Meetings & EventsFind the perfect balance between work and play with our executive meeting facilities. Award-Winning ResortsChoose a resort that’s received some of the most prestigious travel awards in the world.